A big part of the work I do is the process, and trying to find tools that fit the way I work, and are also available. “Available” may mean open source, or free (as it beer) or multi-platform, or some other criteria I come up with. 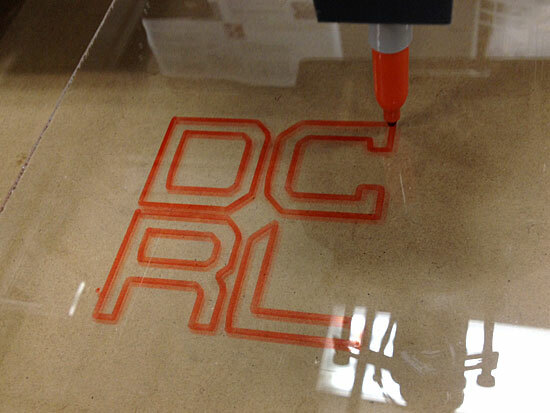 In my Digital Craft class we’ve used RhinoCAM to generate the G-code needed to run the 4×8 CNC router in the DCRL. RhinoCAM has a lot of options, as it should for a full-on commercial package. Meanwhile, I’ve been working on a Shapeoko2, which is a small and affordable hobby-level CNC machine. For a machine like this, I’d like to use a workflow that doesn’t require expensive commercial software, because at some point I may not have access to Rhino and I’ll need tools I can afford. 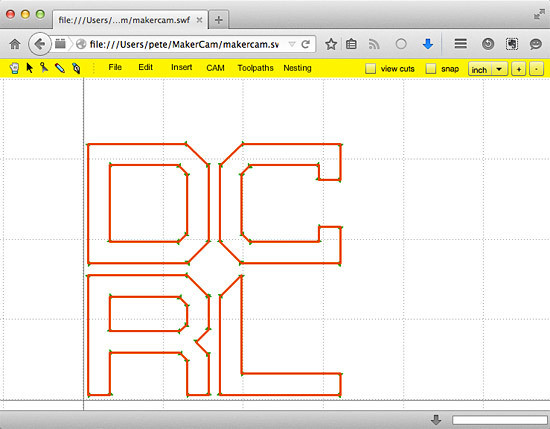 I stumbled up MakerCAM, and there’s a bunch more info about it on the Shapeoko wiki. Basically it’s a Flash application (!) that you can use online, or download and run offline, which provides all the basic needs of a CAM application. And it actually works. 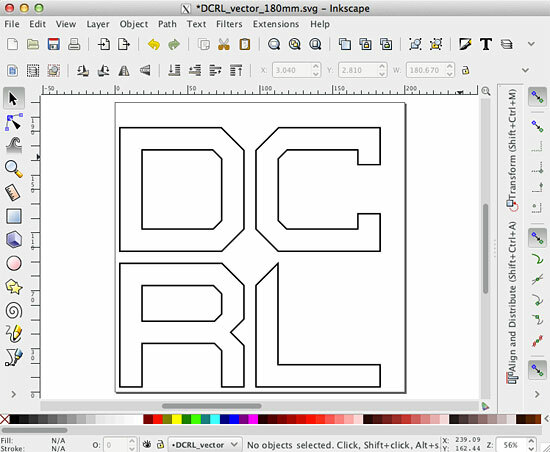 I started as I often do, drawing a 2D vector file in Inkscape. (Oh, I should mention there is an extension for Inkscape called Gcodetools, but we’ll skip that for now.) Once I had my Inkscape file I saved it as an SVG, as you normally would with Inkscape. I then loaded the SVG into MakerCAM. Note that if you load an SVG from Inkscape you need to set the px/inch to 90 in the preferences. 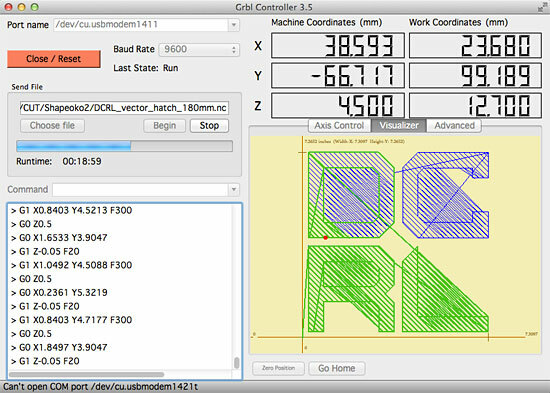 Once in MakerCAM it’s fairly easy to create the toolpaths and generate the G-code. If in doubt, check out the help page and the tutorial page for all the info. Oh, if you want to “run” your G-code before you run your G-code to make sure it’s doing what you think it’s doing, check out OpenSCAM, which is a nice little simulator. Posted on Tuesday, February 24th, 2015 at 7:34 pm. Subscribe to the comments feed. Both comments and pings are currently closed. Post on your own blog. I’ve been using CamBam under mono on Linux for about a week. It’s about a 95% success. Still not free in either sense, but at least I can run it.